Born in Mansfield,Ohio Frank Morris was primarily self taught. He developed as an illustrater and travelled the country documenting our vast mid west. He was influenced by the American tonalist movement of the 1940's and 50's and soon adopted a style of his own using light brush strokes and broad pallet to convey atmosphere and mood. By 1960 he had settled in New York City and started painting cityscapes. 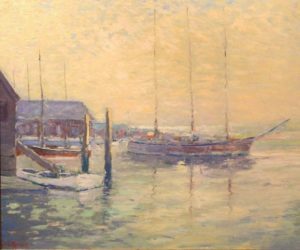 This fine oil on canvas is Mystic Seaport in Connecticut and is one of his rare departures from his New York City views.